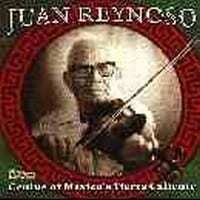 Juan Reynoso is one of the greatest Mexican fiddlers from the hot lowlands (Tierra Caliente) of the State of Michoacan. He is a virtuoso, although he cannot read music. His active repertoire is enormous, and he has at his disposal a gigantic range of ornaments (known as adornos) to bring his music to the absolute heights of emotion. Because of his incredible prowess on the violin Reynoso is known as the Paganini of the Hotlands. While his fiddle style may rival the great Italian master's, Reynoso is a folk artist. His music is never precious; it is not the court music for aristocrats, rather the music of his people. Reynoso plays a variety of genres: sones, pasodobles, danzones, and polkas, but his preferred songform is the Gusto, a Mexican dance with a great rhythmic drive. When he sings, Reynoso has a voice that conveys a joy for life, great experience, and a warm heart. He is accompanied on this album by his sons Neyo and Javier Reynoso. “Born in 1912, Juan Reynoso began playing the violin as young boy. He was a witness to the Mexican Revolution and never had any formal education, but was always fascinated by the violin. He learned entirely by ear and in adulthood began to play with the finest regional musicians. Besides his life as a musician, Juan was a farmer and continued to play mostly as a hobby. He made some recordings and appeared on the radio for a short time in the 1940s but it wasn't until the 1990s that his fame traveled to the U.S. when some of his vintage recordings were released. Genius of Mexico's Tierra Caliente was recorded at the Festival of American Fiddle Tunes between 1997 and 2001. He is joined by his sons Neyo and Javier on guitar along with additional guitarist Ca'stulo Benitez de la Paz on a fiery set of sones, gustos, waltzes and pasadobles. Also we are treated to the highly emotional singing of Juan, Neyo and Ca'stulo. Juan's playing can best be described in much the same way you would describe the late Stephane Grappelli. Whereas Stephane never lost the sound of Paris in his violin, Juan's playing is most definitely from Mexico. It is so moving to hear 87 year old Juan play and sing "Por Que' Has Venido" written by Luis Martinez Serrano in 1927. The passion is so strong in both the vocals and the violin playing. It is followed immediately by a polka, "Viva Tlapehuala" which was Juan's theme song when he played on the radio in Mexico City and is still a favorite. The recording is overflowing with emotional violin playing and spirited singing. Juan Reynoso certainly deserves to be called the Genius of Mexico's Tierra Caliente. ” - Tom Druckenmiller — Sing Out!